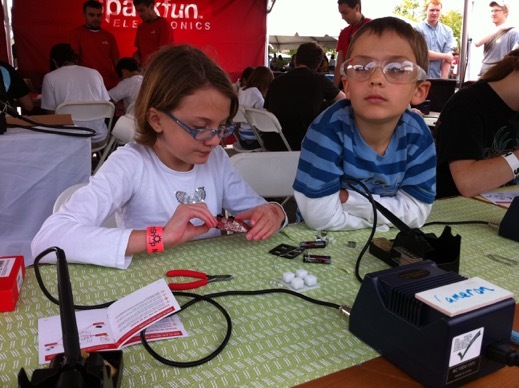 We took the kids up to New York to World Maker Faire. It was really hot for September, to the point where Carter had sun stroke, or at least dehydration, on the Saturday, poor kid, so we had to duck out early. He rallyed on Sunday though, and we got to spend the full day there. We screen printed t-shirts, Cameron learned to solder with SparkFun, the kids both made casts of their fingers in algir, and we got to take things apart in the deconstruction zone. We also managed to catch up with some Hack Pittsburgers while we were there too. All in all, it was a really fun weekend, and we’ll definitely go again next year: perhaps to the Detroit one this time.